Crescent Courtship - by Tom Thordarson of THOR ART - It’s a warm and misty Hawaiian evening on a calm and tepid tropical lagoon. 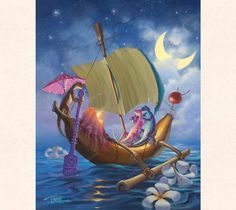 Home Pinterest Crescent Courtship - by Tom Thordarson of THOR ART - It’s a warm and misty Hawaiian evening on a calm and tepid tropical lagoon. Crescent Courtship - by Tom Thordarson of THOR ART - It’s a warm and misty Hawaiian evening on a calm and tepid tropical lagoon. The moon is large and golden with a crescent form that shimmers like liquid gold upon the gentle water’s surface. The smell of fresh plumeria fills the night air with magic and romance. Oblivious to place and time, they embrace each other gently, bathed in the warm candle’s light that contrasts perfectly with the cool trade-winds that fill the banana leaf sail.